I am very new at this so please bear with me. I have been doing a circuit type workout for weight loss for the past month when I get home after work. My work schedule just changed so I am now getting up at 5:00 AM and doing my work out before I go to work. The problem is that I don't eat anything before my work out. I have been reading that not eating before a work out is bad. Everything that I read says that I need to eat something 45 min to 1 hour before working out, but I can't swing it, I don't want to get up at 4:00 AM to eat. What is the absolute minimum I could get away with and not do my body any harm. Can I just chug a protein shake and get cracking within 15 minutes? I still have lots of weight to lose, so maybe it's ok since I have reserves LOL. A guy at work made the mistake of not eating one morning before working out. He blacked out because of lack of glucose. There should be no excuse for not eating with everything available. There's cold cereal, toast, juice, yogurt, etc. Remember, Rocky ate raw eggs. If you must demand to eat the minimum, then go ahead and test yourself to see how far you can go before starting to get dizzy or spent. It's not that I don't want to eat. It's just that I don't have time to let an hour pass after eating before my workout. What I am wondering is would it be just as effective if I eat something lite like a protein shake and fruit and then start working out immediately or is that just useless because it the nutrients haven't been digested. I don't think it's as bad as tostig says. If you've got time to eat, do so. Plenty of folks who do a form of intermittent fasting (IF) exercise on an empty stomach. I've tried this - you can just get used to it. You probably would do better if you could drink a whey protein shake and eat a banana an hour before, but if not, or if eating it only 15-30 minutes before doesn't sit well with your stomach...I wouldn't worry about it. You might have some problems if your workout is very strenuous, but equally you might have problems with a strenuous workout on a full stomach. I would give it a try and see. If you feel light-headed or if your workout is grossly sub-par, it's a problem. If not, it's not. You've had a month of the workout to compare to, so if you start it up and you're underperforming, you know it's an issue. If so, I'd try a small meal as early as you can and work up from there. 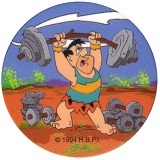 tostig wrote: A guy at work made the mistake of not eating one morning before working out. He blacked out because of lack of glucose. Not everyone is the same on this. Lots of people work out in the morning without eating, and suffer no ill effects. We've had this discussion before. It bothers some people, so like Peter says, try and find out for yourself. If it's right for you, it's right for you. ScubaDiver wrote: What is the absolute minimum I could get away with and not do my body any harm. Experience is the best teacher. You should try working out on an empty stomach, but start slowly at a lower intensity than usual. Depending on how you feel, up the intensity or sip on a sports drink like Gatorade as you work out if you feel light headed. Lots of bodybuilders seeking to lean out do empty-stomach cardio first thing in the morning with no ill effects. Your idea of eating light is fine. A protein shake and a little fruit would be a good idea if you feel you need to eat. Keep it light if you don't have much time. As the others, with the exception of Tostig, said, try it and find out. I personally have no problem whatsoever working out on an empty stomach. Part of eating breakfast or not depends on what your body is used to using for energy. If you eat a traditional high-carb diet, you need to eat breakfast. You also need to eat frequently in order to keep up your energy. if your body has adapted to burning fat for energy, because of a low-fat diet, you can easily go for extended periods without eating. Working out on an empty stomach becomes easy. 200-300 kcal of nutrition for every hour before workout. Typically this would be low GI. 4:1 carb:protein. Preferably some form of soy protein as it will help sustain you during the workout. 100-200kcal immediately 10mins before commencing the workout, simple sugars. A couple of 100kcal energy gels or my favourite, 200ml juice, 30g glucose powder. Very Cool - Thanks for all the info. I definately feel good during my morning workout - so I will continue - but I will add something light to eat about 15 minutes before starting. I was worried about breaking down the muscle I have recently built by not eating. Unless your workouts are very intense, you really shouldn't have to worry about musle breakdown. Just make sure your post workout nutrition is good.Again, as the others have said, go by feel.